My brother is thinking of venturing into seafood business. He came by a number of seafood suppliers whom are able to supply him with fresh seafood with good wholesale prices. As he is a busy businessman in his transportation business he is not able to take care of the seafood business personally. For this business expansion, he has to rely on the staff to run the business for him. As we all know, seafood is perishable especially in the warm climate like ours. Fish can easily turn bad if they are not properly stored. So he has to ensure that proper and suitable seafood displays are in place for the business to run smoothly without much headache to him. 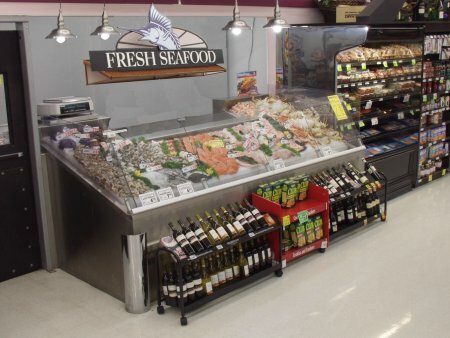 Besides having proper storage, the display of the seafood is also very important to attract customers. It has to be clean and be able to keep seafood fresh at all time, therefore having nice and suitable seafood display cases is not only necessary but is a must-have display counter in any seafood outlets. He has been looking around to search for the display cases lately. There are a number of seafood display cases that he is considering of buying, it is all depends on what sort of concept he would like to have for his outlet. We are also putting our minds together to help him with this business expansion. Like the saying goes, the starting stage of any business venture is always the toughest. The above two seafood displays would be suitable for most seafood outlets. 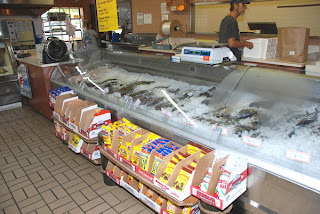 We like to buy fresh seafood same goes to our customers. To have repeat customers, we will have to take extra affords to make sure our products are up to their satisfaction. We are looking forward to have fresher seafood mechandises once our brother's seafood outlet is in operation.